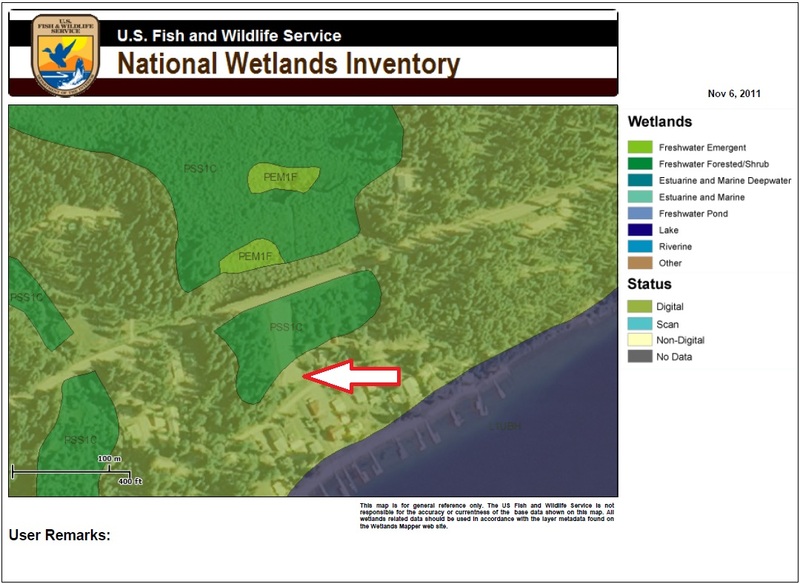 The USFWS wetland inventory map. An arrow shows the bulldozed Sackett property. It took all of 5 minutes to create the above map, using the US Fish and Wildlife Service wetlands mapper. Had the Sackett’s taken the time to to look into it before bulldozing their property and filling it with gravel, or had they made a call to the US Army Corps of Engineers for an advance wetland determination, they could have avoided the legal mess that they find themselves in. Indeed, it is so easy that since 2008, Bonner County has required this minimal wetlands reconnaissance prior to granting Building Location Permits. Ultimately, the Sacketts could very well be right about the non-existence of wetlands on their property. Still, a modicum of due diligence should be a prerequisite for a Supreme Court case of Constitutional due process. It takes very little effort to avoid EPA enforcement actions. The problem that is not discussed is that most people are not born with knowledge that they must separately contact the EPA before filling in (oh, I mean discharge) the dry gullies and low places on their properties. If all the required building permitting officials in their communities are not aware how in the world would the average person know. The EPA creates rules and the way they get the word out or educate is to come out and start fining people for rules they have no knowledge of.. and if you complain they threaten you with the 37,500.00 per day….I am watching the same scenario develop here first hand. I am an engineer and cringed when I witnessed EPA field inspectors calling dry gullies 8″ deep just caused by a heavy rain as ephemeral streams….All the engineering, permits etc all in order and the EPA just shows up and declares they have jurisdiction and they were not consulted……And in a not too subtle way implied they wouldn’t have declared it was not their jurisdiction if we had asked..Who knows to even ask…You are not dealing with evil people, enemies or necessarily rich people taking advantage or destroying nature or the environment.. Cooperating in the case I am following cost hundreds of thousands $$…for working in a cow pie pasture rather than the literally millions THREATENED by the EPA and no recourse to say it is not a wetlands..